Not since the days of Bond-mania in the early 1960s had the release of a movie been as anticipated as the first of George Lucas' Star Wars prequels. Before The Phantom Menace reached screens, Lucas was geeks' Golden Boy and the term "prequel" hadn't yet taken on a negative connotation. Bolstered by an eye-popping theatrical trailer, the fourth Star Wars movie was awaited by both fans and non-fans alike. Then the movie opened and the bubble popped. Looking back through the haze of 16 years, an objective observer may recognize that some of the vitriol spewed at The Phantom Menace was undeserved, the result of missed expectations. By choosing to tell this story, Lucas set himself up for a fall. After all, he wasn't treading into unexplored territory so any deviation from what die-hards saw as their vision would be greeted with scorn. Over the years, some of the most passionate followers had developed a sense of entitlement. Their interest was proprietary. And when the final product fell short, they reacted like jilted lovers. The Phantom Menace is neither as bad as its detractors would argue nor as good as its ardent defenders would claim. When seen in the broader context of the prequels, its relevance is limited - the real meat of the backstory is presented in Attack of the Clones and Revenge of the Sith. 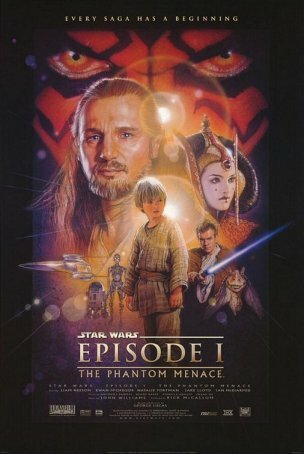 The Phantom Menace is an appetizer, and a strange one at that. Parts are aggressively aimed at children while others, such as the convoluted politics, are for a more sophisticated audience. This uncomfortable dichotomy is the film's biggest underlying structural flaw and gives rise to many of the other negatives. The Phantom Menace begins by introducing us to the intrepid duo of Jedi Master Qui-Gon Jinn (Liam Neeson) and his apprentice, Obi-Wan Kenobi (Ewan McGregor, stepping into the costume of the irreplaceable Alec Guinness). These two are on a diplomatic mission to the planet Naboo, where they hope to negotiate the end to a blockade of the planet organized by the Trade Federation. Upon arrival, they fall into a trap orchestrated by the mysterious Darth Sidious (Ian McDiarmid), a Sith Lord making a play to take control of the Galactic Republic. Qui-Gon and Obi-Wan reach Naboo in the midst of an invasion by an army of droids. After befriending the amphibious Jar Jar Binks (Ahmed Best), they move to the aid of Naboo's teenage ruler, Queen Amidala (Natalie Portman), spiriting her away from her planet to safeguard her well-being. From Naboo, the action moves to the desert planet of Tatooine, where the Jedi encounter young Anakin Skywalker (Jake Lloyd), a slave child with a strong affinity for the Force. They are tracked to the barren world by Sidious' apprentice, Darth Maul (Ray Park), who has orders to eliminate the Jedi and capture the queen. As a stand-alone space opera, The Phantom Menace works well enough, although it's a little too long-winded for its own good. There are some tremendous stand-alone set pieces: the introductory battle in which Qui-Gon and Obi-Wan escape Sidious' trap, the pod race, and the Duel of Fates that pits two Jedi against one Sith. These segments represent Lucas at his best as both a storyteller and a director. Lucas' pandering to children gets him into the most trouble, but this isn't the first time that has happened. The Ewoks in Return of the Jedi sabotaged that film. Here, it's Jar-Jar Binks. I'm not among those who believe Jar-Jar is consciously reflective of the Minstrel tradition. Lucas is a well-known champion of civil rights and black history (witness his involvement in Red Tails). The problem with Jar-Jar isn't latent racism, it's that he is annoying and stupid. Intended to provide comic relief, he ends up being a throwback to the silent film era when clumsy slapstick and pratfalls amused audiences. The under-8 crowd will laugh at Jar-Jar's antics but he quickly becomes an unbearable irritant to older viewers. Although impressively rendered from a special effects perspective - Jar-Jar was a complete CGI character before those were in vogue - the film's inability to use him in a compelling or interesting fashion makes this a moot point. Narrative contrivances are a pet peeve of mine and the climax of The Phantom Menace is marred by a large one. The plot contortions necessary to get Anakin aboard the ship controlling the droid army are bad enough but what follows defies logic and intelligence. I understand this is intended to mirror/foreshadow Luke's attack on the Death Star in A New Hope but whatever combination of luck and the Force allow Anakin to succeed challenges credulity. Part of the problem with accepting Anakin's role in the climax results from the unconvincing, amateurish performance of Jake Lloyd. ("Yippee!") This represents the most persuasive evidence of Lucas' inability to mold performances and direct actors. Lloyd did standout work in Nick Cassavetes' 1996 Unhook the Stars and there was no reason to assume the part of Anakin would defeat him so utterly. Yet there's rarely a moment when he's convincing and there are times when his portrayal is cringe-worthy. Lloyd's best moments (and there are a few of them) occur when he has no dialogue. Natalie Portman falls prey to the some of the same problems. When she made The Phantom Menace, she was still a teenager and would have benefitted from a more empathetic director. This doesn't seem like the same actress who amazed in The Professional and charmed in Beautiful Girls. Her lackluster performance can be attributed in part to Lucas. Strong efforts are turned in by the likes of Ewan McGregor, Liam Neeson, and especially Ian McDiarmid, but these are veteran actors who don't need a strong guiding hand to bring them to the point where they can breathe life into a character. Dialogue has never been Lucas' strong suit. This isn't a flaw in only The Phantom Menace; it's endemic to all the Star Wars movies to one degree or another. However, there seem to be in inordinate number of clunkers in The Phantom Menace. Portman and Lloyd get the lion's share of these, arguing that a bad line may not sound quite as bad when uttered by someone with many years' acting experience. Alec Guinness, for example, made much of Lucas' dialogue sound respectable. Nostalgia played a big part is some of what The Phantom Menace had to offer. As the first Star Wars movie in 16 years, it provided fans with an opportunity to reminisce. Many of the call-backs don't have the same impact today that they had in 1999. In addition to returning to the screen characters Obi-Wan, R2D2, C3PO (in a less mature form), Yoda, and Palpatine, the film offers a variety of "Easter Eggs." Jabba the Hutt, jawas, banthas, and sandpeople make cameos. In some cases, ship design echoes that of the original trilogy. World building and visual effects represent Lucas' strengths. The "galaxy far, far away" he invented in 1977 remains a strong and vital place. The prequels offered him an opportunity to expand upon places and ideas introduced during the original trilogy. The Phantom Menace gives us new worlds to explore in Naboo and Coruscant. It returns us to Tatooine, a planet central to both trilogies. Lucas gives each world its own personality and aspects of his vision - for Naboo's underwater kingdom and Coruscant's overpopulated, worldwide metropolis - are spectacular, especially when seen on the big screen. One scene in particular, a sunset scene on Coruscant with Obi-Wan and Qui-Gon in the foreground, is dazzling. There are times when The Phantom Menace looks so damn good that it's easy to forget its narrative limitations. Lucas frequently cited "technical limitations" as a reason why the gap between Episodes VI and I stretched to 16 years. Like Steven Spielberg, James Cameron, and Peter Jackson, Lucas has always been most comfortable when pushing special effects boundaries. In 1977, there had never been anything to rival A New Hope. Likewise, in 1999, The Phantom Menace did things no previous motion picture had attempted: fast-paced space battles, robot armies, intricately detailed planetscapes, hundreds of diverse alien species. The complexity of the effects was so extreme that The Phantom Menace still looks cutting-edge today, 16 years later. If there's one single aspect more than any other that shouts, "Star Wars has returned! ", it's the John Williams score. Across four decades, no name other than Lucas has been more intimately associated with the saga than Williams. His music is as important a part of the movies as the special effects, ship design, and actors. It's impossible to understate the importance of his themes… the Main Title, The Imperial March, Yoda's Theme, and so on… Williams' music can turn mediocre scenes into good ones and good ones into great ones. His influence is just as strong in The Phantom Menace as in any of the other films. How much of the grandeur of the Obi-Wan/Qui-Gon/Darth Maul fight is attributable to Williams' score? I dread the inevitability of a Star Wars film with a different composer. The ending, with the cross-cutting among Anakin's Big Adventure, the Jedi/Darth Maul duel, the Naboo war, and Amidala's attempts to capture the Viceroy, represents vintage Lucas. This is the template he used in Return of the Jedi. From a technical perspective, it's a satisfying way to craft a climax but the specifics are marred by Jar-Jar's antics and Jake Lloyd's inability to "sell" Anakin's single-handed destruction of the droid control ship. The Phantom Menace isn't far from a thoroughly entertaining stand-alone space opera. The underlying plot is well considered and at times even ingenious. Lucas' big misstep is in believing that, by skewing certain elements to appeal to the very young, he would be able to maintain a mature, epic feel. The reasons why almost every six-year old adores The Phantom Menace are why adults wince. This is, however, very much Star Wars and to ghettoize it is to ignore that its infractions are no more egregious than those committed by Return of the Jedi and its peaks are higher than those of the original trilogy's finale. Once the viewer overcomes the hurdles of Jar-Jar and Jake Lloyd - admittedly difficult obstacles - The Phantom Menace is enjoyable. Over the years, multiple viewings have tempered my opinion of The Phantom Menace. My original review, written in the immediate wake of an early screening when the sheer splendor of spectacle trumped all else, trumpets an enthusiasm I no longer feel. It's often that way with first impressions. However, warts and all, The Phantom Menace remains a chapter of Star Wars and is undeserving of the most vicious aspersions cast in its direction. The mistakes are significant but they don't eclipse the strengths. This is as much Star Wars as the other films under the umbrella. For my original review, go to this link.